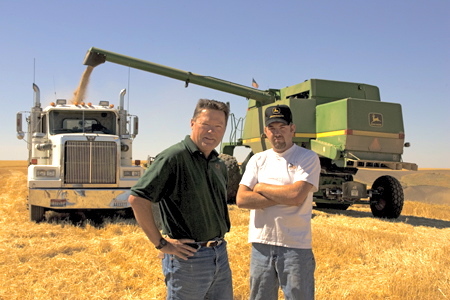 Stone-Buhr is proud to work with small family wheat farmers like Read and Jeremy Smith of Cherry Creek Farm in St. John, Wash., who are committed to sustainable agriculture and to making native plants and wildlife part of their farming practices. 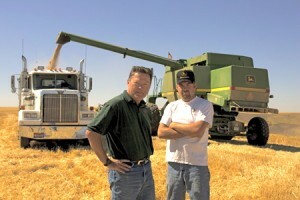 The father-son team of Read and Jeremy Smith has never strayed too far from their land. With six generations of farmers in the family, both 31-year old Jeremy, and his father, Read, are committed to farming and land management practices that challenge the norm. Their focus on sustainability is best demonstrated by the Smith’s direct-seeding crop system, implemented 30 years ago to help maintain soil quality. The Smiths are also proud of the work they’ve done to restore the indigenous plants to more than five miles of stream banks on their property. “Native plantings like willows and cottonwoods stabilize the stream banks against erosion and recreate the landscape from more than a century ago,” says Read.